Information is a commodity. Corporations are passing around consumer behavioral profiles like brokers with stocks, and the vast majority of the American public is none the wiser of this market’s scope. 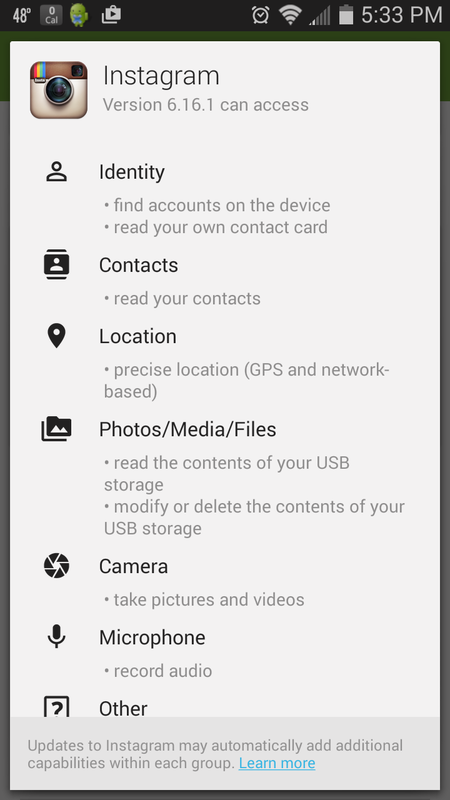 Very few people actually check the permissions portion of the Google Play store page before downloading a new app, and who has time to pore over the tedious 48-page monstrosity that is the iTunes terms and conditions contract? With the advent of wearables, ubiquitous computing, and widespread mobile usage, the individual’s market share of their own information is shrinking at an alarming rate. In response, a growing (and vocal) group of consumers is voicing its concerns about the impact of the effective end of privacy online. And guess what? It’s up to designers to address those concerns in meaningful ways to assuage consumer demand. But how can such a Sisyphean feat be managed? In a world that demands personalized service at the cost of privacy, how can you create and manage a product that strikes the right balance between the two? That’s a million dollar question, so let’s break it into more affordable chunks. The big problem with informed consent is the information. It’s your responsibility to be up front with your users as to what exactly they’re trading you in return for your product/service. Not just the cash flow, but the data stream as well. Where’s it going? What’s it being used for? 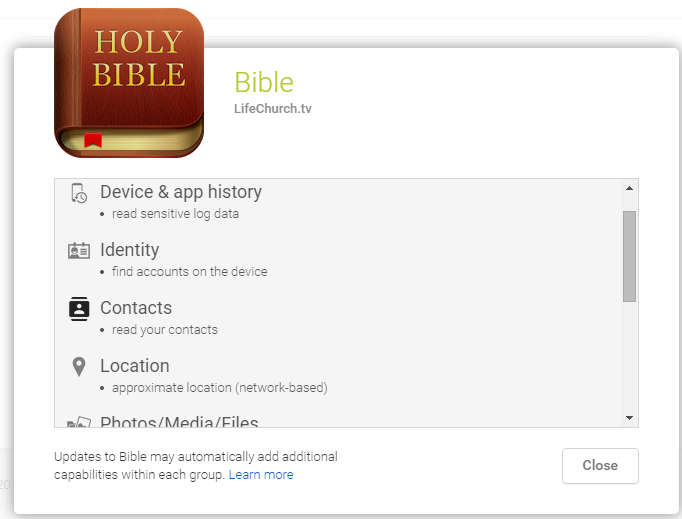 99.99% of all smartphone apps ask for permission to modify and delete the contents of a phone’s data storage. 99.9999% of the time that doesn’t mean it’s going to copy and paste contact info, photos, or personal correspondences. But that .0001% is mighty worrisome. Let your users know exactly what you’re asking from them, and what you’ll do with their data. Advertise the fact that you’re not sharing it with corporate interests to line your pockets. And if you are, well, stop that. It’s annoying and you’re ruining the future. How can you advertise the key points of your privacy policies? Well, you could take a cue from noted online retailer Zappos.com. 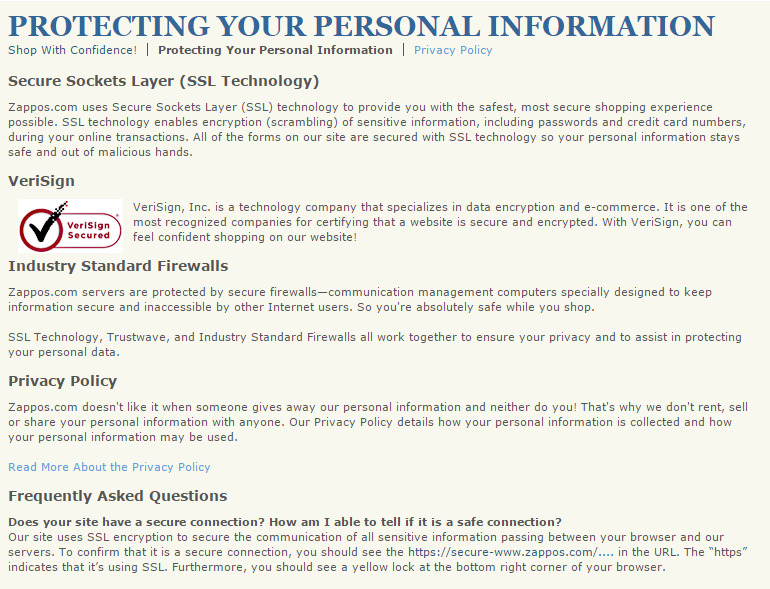 Their “PROTECTING YOUR PERSONAL INFORMATION” page serves as a decent template for transparency. They also describe their efforts to safeguard user data from malicious hacking threats through the use of SSL tech and firewalls. Then they have an FAQ addressing commonly expressed security concerns. Finally, they have a 24/7 contact line to assure users of personal attention to their privacy queries. Now it should be noted that this is a template for a good transparency practices, and not precisely a great example of it. The content and intention is there, so what’s missing? So who does a better job? CodePen has actually produces an attractively progressive solution. 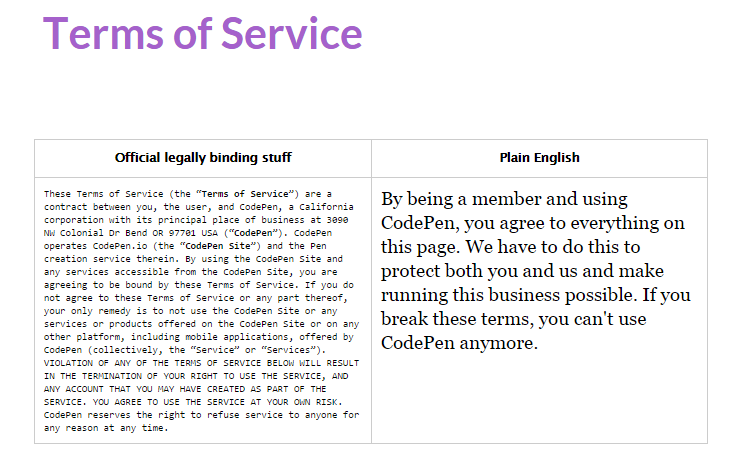 As you can see, CodePen has taken the time to produce two different versions of their ToS. A typical, lengthy bit of legalese on the left, and an easily readable layman’s version on the right. Providing these as a side by side comparison shows user appreciation and an emphasis on providing a positive UX. This is all well and good for the traditional web browsing environment, but most of the problems with privacy these days stem from mobile usage. Let’s take a look at how mobile applications are taking advantage of the lag between common knowledge and current technology to make a profit off of private data. 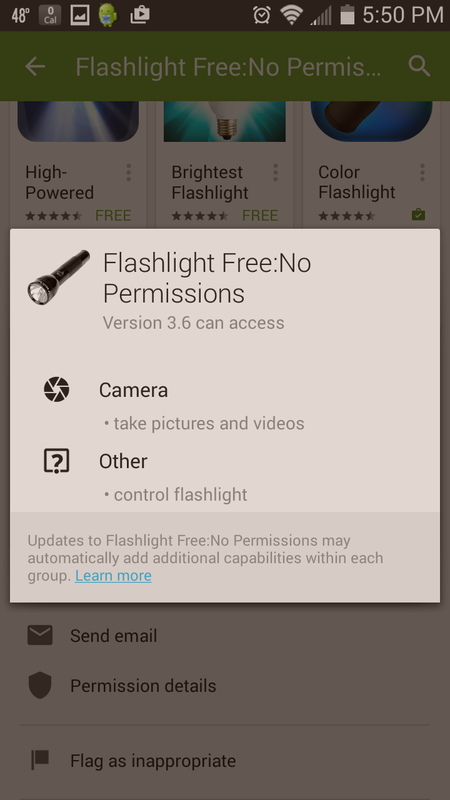 Why, pray tell, does a flashlight have any need for your location, photos/media/files, device ID and/or call information? I’ll give you a clue: it doesn’t. Now the policy is up to date, but the insidious data gathering and selling continues. Unfortunately, it isn’t the only flashlight application to engage in the same sort of dirty data tactics. The fact is, you have to do a surprising amount of research to find any application that doesn’t grab a bit more data than advertised, especially when the global market for mobile-user data approaches nearly $10 billion. For your peace of mind, there is at least one example of an aptly named flashlight application which doesn’t sell your personal info to the highest bidder. But don’t get too enthusiastic just yet. This is just one application. How many do you have downloaded on your smartphone? Chances are pretty good that you’re harboring a corporate spy on your mobile device. Is nothing sacred? To the App developer’s credit, they’ve expressed publicly that they’ll never sell user data to third party interests, but it’s still a wakeup call. What then, are some UX friendly solutions? Designers are forced to strike a balance. Apps need data to run more efficiently, and to better serve users. Yet users aren’t used to the concerns associated with the wholesale data permissions required of most applications. What kind of design patterns can be implemented to bring in a bit of harmony? First and foremost, it’s important to be utilitarian in your data gathering. Offering informed consent is important, letting your users know what permissions they’re granting and why, but doing so in performant user flows is paramount. 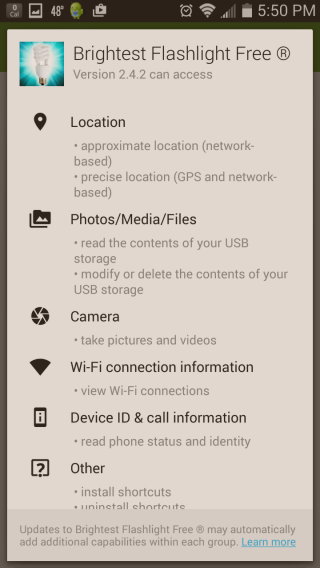 For example, iOS has at least one up on Android with their “dynamic permissions.” This means iOS users have the option of switching up their permissions in-app, rather than having to decide all or nothing upon installation as with Android apps. 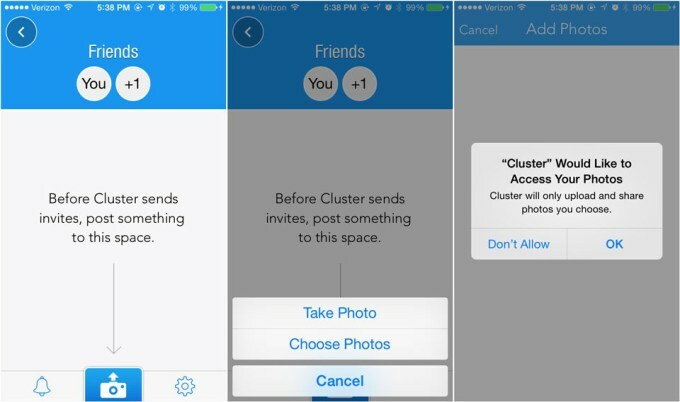 Note how the Cluster application prompts the user to give access to their photos as their interacting with the application, and reassures them of exactly what the app will do. The user is fully informed, and offers their consent as a result of being asked for a certain level of trust. All of this is accomplished while they’re aiming to achieve a goal within the app. This effectively moves permission granting to 100% because the developers have created a sense of comfort with the application’s inner workings. That’s what designing for privacy is all about: slowly introducing a user to the concept of shared data, and never taking undue advantage of an uninformed user. Of course, this is just one facet of the privacy/UX conversation. Informing a user of what they’re allowing is important, but reassuring them that their data is secure is even more so. Asking a user to trust your brand is essential to a modern business model, you’re trying to engender a trust based relationship with all of your visitors, after all. The real trick, however, is convincing users that their data is safe in your hands—in other words, it won’t be sold to or stolen by 3rd parties, be they legitimate corporations or malicious hackers. We touched on this earlier with the Zappos example. Zappos reassures its shoppers with SSL, firewalls, and a personalized promise never to share or sell data. All of which should be adopted as industry standards and blatantly advertised to assuage privacy concerns. Building these safeguards into your service/application/website/what-have-you is extremely important. To gain consumer trust is to first provide transparency in your own practices, and then to protect your users from the wolves at the gate. Whatever security solutions you choose, the priorities remain the same. Build trust, and more importantly: actually deserve whatever trust you build. It hardly needs to be stated, but the real key to a future where personal privacy still exists, is to actually be better people. The kind that can be trusted to hold sensitive data. Is such a future still possible? Let us know what you think in the comment section. Kyle Sanders is a member of SEOBook and founder of Complete Web Resources, an Austin-based SEO and digital marketing agency. Google recently added highlights at the bottom of various sections of their mobile search results. 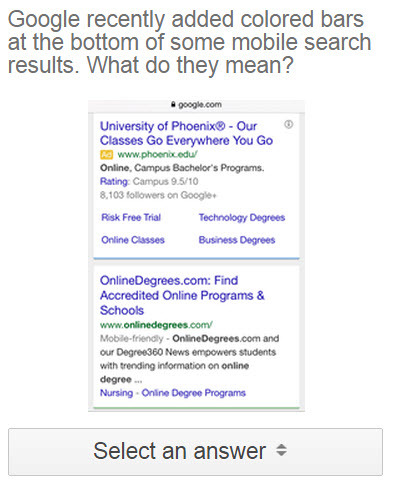 The highlights appear on ads, organic results, and other various vertical search insertion types. The colors vary arbitrarily by section and are patterned off the colors in the Google logo. Historically such borders have conveyed a meaning, like separating advertisements from organic search results, but now the colors have no meaning other than acting as a visual separator. We recently surveyed users to see if they understood what the borders represented & if they felt the borders had any meaning. We did 4 surveys total. The first 2 allows a user to select a choice from a drop down menu. The last two were open ended, where a user typed text into the box. 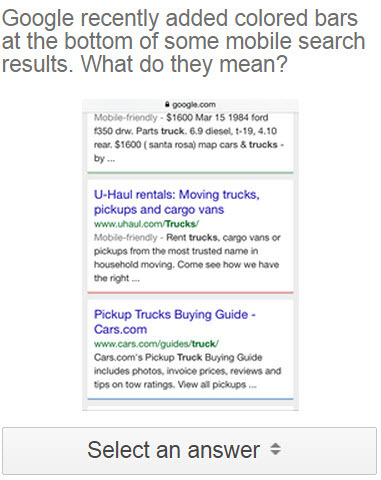 For each of the 2 survey types, we did a survey of a SERP which had an ad in it & a survey of a SERP without an ad in it. Below are the associated survey images & user results. Google recently added colored bars at the bottom of some mobile search results. What do they mean? Given there are 5 answers, if the distributions were random there would have been a 20% distribution on each option. The only options which skewed well below that were the perceptions that the colored highlights either had no meaning or represented free/organic search results. Link to survey results: without ads vs with ads. Like the above surveys, on each of these I ordered 1,500 responses. As of writing this, each had over 1,400 responses completed & here are the word clouds for the SERPs without an ad vs the SERPs with an ad. On each of the above word clouds, we used the default automated grouping. 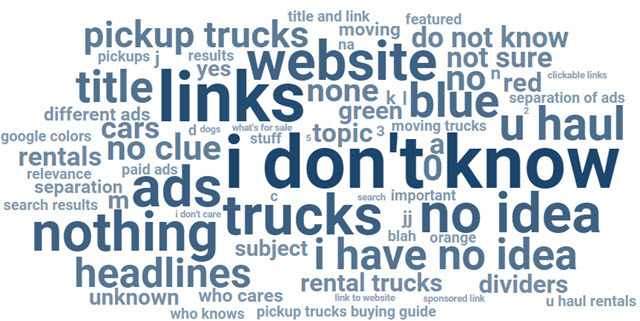 Here is an example of what the word cloud would look like if the results were grouped manually. For a couple years Google has removed various forms of eye candy from many organic results (cutting back on video snippets, limiting rich rating snipets, removing authorship, etc.). The justification for such removals was to make the results feel "less cluttered." At the same time, Google has added a variety of the same types of "noisy" listing enhancements to their various ad programs. What is the difference between reviews ad extensions, consumer ratings ad extensions, and seller ratings ad extensions? 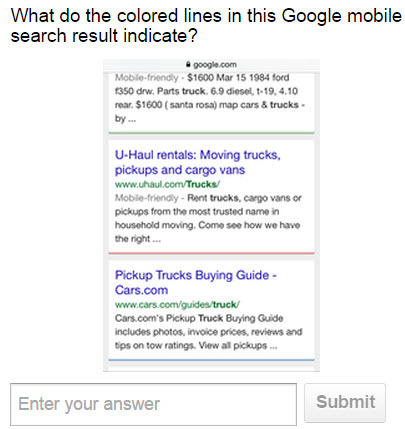 What is the difference between callout extensions and dynamic structured snippets? Long ago AdWords advertisements had a border near them to separate them from the organic results. Those borders disappeared many years ago & only recently reappeared on mobile devices when they also appeared near organic listings. That in turn has left searchers confused as to what the border highlighting means. According to the above Google survey results, the majority of users don't know what the colors signify, don't care what they signify, or think they indicate advertisements.